The impacts of such a shutdown will be devastating. Citizens will have to wait in long lines at state-managed distribution points to receive a mere 25 liters of water per day, less than half the water needed for one average shower. Experts are already warning of public health concerns like poor sanitation leading to faster spreading of dangerous diseases, especially for the city’s poorest residents, and forecasting that pipes may crack from dry conditions, endangering future water distribution if and when the drought ends. The Western Cape Premier has warned that “normal policing will be entirely inadequate” to manage the chaos that could ensue. Water management becomes even more difficult in times of drought. 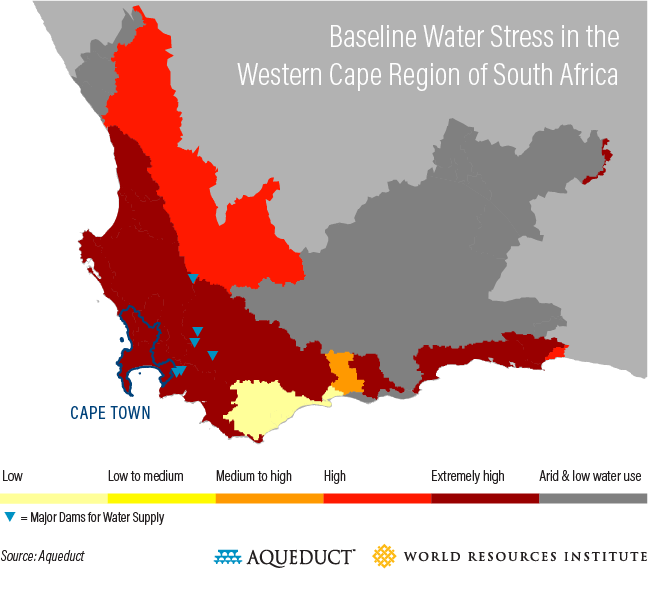 For example, as the Western Cape’s reservoirs began to dry in 2015 and 2016, the national government allocated 40 percent of the province’s water to agriculture, leaving 60 percent to Cape Town. This controversial decision caused a great deal of debate in local politics, and is now seen as one of many culprits for the current crisis. This situation is common for many cities, but leaves them fighting with other sectors when water supplies decline. One solution is for city planners and water utilities to undertake proactive, integrated urban water management strategies that consider drinking water, wastewater and urban drainage (stormwater) more comprehensively, helping cities to build greater resilience and efficiency. This method also takes a holistic view of water sources and uses across a city, recognizing that the actions of every stakeholder impacts the others. Amid the nearly six-year California drought, the city of Los Angeles began developing a One Water plan to better manage limited water resources, stave off the impacts of climate change, and slash the city’s purchases of imported water by 50 percent. Cities should also look beyond their boundaries and invest in “natural infrastructure” for protection. Green spaces such as forests and wetlands can act as a sponge by shielding cities from floods and storms and regulating flow during dry seasons. Research also shows that pairing natural infrastructure with traditional “grey” infrastructure like wastewater treatment plants can help cities create jobs, buffer against the impacts of climate change and save money on water treatment. Inadequate built and natural infrastructure compounded the effects of São Paulo’s 2014-2017 drought. The city lost more than 30 percent of treated water through theft and leaky pipes. Deforestation of the Amazon disrupted the “rivers of the sky” that regulate rainfall across Brazil, and loss of nearby Atlas forests also destroyed local water systems. São Paulo, Cape Town and other cities should consider natural infrastructure as one of many solutions for resilience to future water shocks. 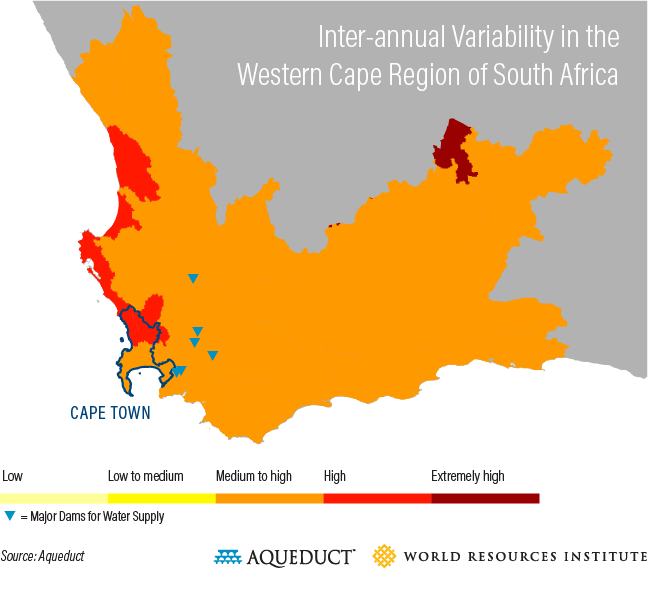 The situation in Cape Town is unique in many ways, but there are common threads that tie it to São Paulo, Los Angeles, and cities around the world facing growing water risks. In the countdown to Day Zero, the South African national government and the City of Cape Town are working hard to help residents avoid the drought’s worst effects. But other cities should also use this moment as a warning – without better water risk measurement, management and resilience, the next Day Zero could be coming to your corner of the world.